Thousands of Filipinos demonstrated on Friday against last week’s burial of former dictator Ferdinand Marcos in a heroes’ cemetery, showing disdain for the veneration afforded to a strongman accused of widespread plunder and brutality. More than 10,000 joined the protest, many under umbrellas following an afternoon of rain. They held banners and placards saying “Marcos no hero” and “You can’t bury the truth”. 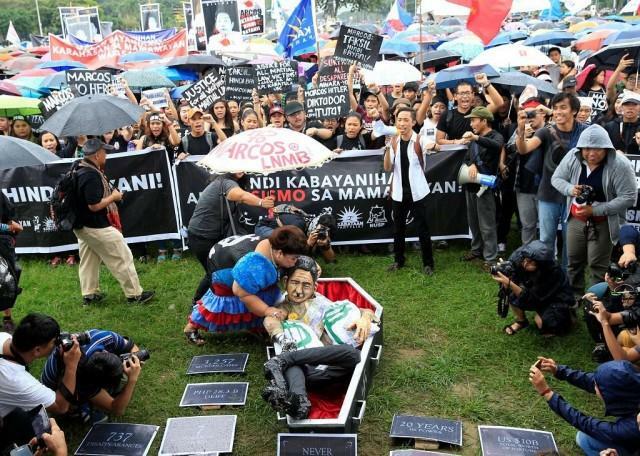 Those persecuted during martial law under Marcos joined students and activists in marches in Manila, in what was a subdued show of anger at a burial with military honours that was kept under wraps until just a few hours beforehand. Marcos ruled the Philippines for 20 years, imposing martial law in 1972 and governing by decree in what was one of the darkest chapters of the country’s history. President Rodrigo Duterte had called for the burial, 27 years after Marcos’s death, arguing that as a former military man and head of state, he met the criteria for a place in the heroes’ cemetery. The family remains a highly influential political force and has relentlessly pushed for the burial of Marcos in what critics say is an attempt to clear his name. Judges on the Supreme Court on Nov. 8 ruled 9-5 in favour of throwing out petitions against the burial. Chants of “Marcos, Hitler, diktador, tuta!” also echoed in the crowd along with other anti-Marcos slogans. Some protesters were still in their uniforms as they came directly from their schools. Proudly waving their “Marcos hindi bayani” signs were students from St. Scholastica’s College, University of Sto. Tomas, University of the Philippines Diliman, UP Manila, Adamson University, and Polytechnic University of the Philippines . Members of the Health Alliance for Democracy (HEAD), Kilusang Mangbubukid ng Pilipinas, ACT Teachers Partylist, and GABRIELA also participated in the protest. Meanwhile, a handful of people introducing themselves as the “Duterte Youth Group” showed up at Luneta in support of the Marcos burial. A couple of debates sparked when anti-Marcos protesters faced off against supporters of the late dictator. The Duterte supporters left the park at past 8 p.m. The program was generally peaceful, with human rights advocates and victims of the Martial Law regime taking to the stage, including former Senator Rene Saguisag and former Representatives Satur Ocampo and Neri Colmenares. Saguisag said he was “exhilirated” by the participation of youth at the event. “I thought kami lang na may tungkod ng mga darating,” he told GMA News Online. He added that one good thing about Marcos’ “surreptitious burial” was the spreading awareness about the truth of Martial Law. Daryll Baybado, who studies at University of Sto. Tomas and is the Secretary General of the College Editor’s Guild of the Philippines, said that they will proudly take up the fight of the EDSA Revolution. “Importante yung parang nangyari na passing the torch. Yung nga pinaglalaban nila parang walang nangyari eh,” he said. “Itutuloy namin ang laban,” he added. Student activists from the Marcos era also went onstage to meet the current generation of youth leaders. Calling themselves “senior citizen protesters,” they expressed their delight at the youth’s participation at the protest. “Hindi na namin maaabutan ang tunay na pagbabago. This is the only consolation,” said Medi de Jesus, who was an activist during Marcos’ presidency. “Napakasaya na maraming kabataan ngayon,” she added. The program proper ended at past 8 p.m., but rallyists continued to trickle in to Luneta. A concert featuring singers and spoken word performers began before 9 p.m.
Before heading to Luneta, youth group Anakbayan demonstrated at Mendiola outside the Malacañang compound to take into task President Rodrigo Duterte for allowing the late dictator to be buried at the heroes’ shrine. “Today youth and students and people from all walks of life unite to hold the Duterte regime accountable for giving a hero’s burial to a dictator, plunderer, and human rights violator. Today we link arms to denounce Duterte’s unholy alliance with the Marcoses,” said Anakbayan National Chairperson Vencer Crisostomo. Duterte, meanwhile, defended his decision in a speech in Zamboanga City. “Wala kaming choice. We cannot have a different interpretation because it simply says that a soldier and a former President are qualified to be buried in the Libingan ng mga Bayani,” Duterte said in an interview in Zamboanga City. “I am trained to follow simply the law. It was a simple matter of amending the law and they had about — yung nanay, pati ang anak then — six, six [equals] 12, 12 golden years to do it tapos ikaw pa ngayon — bakit hindi mo na lang para klaro na allowed ka talaga?” he added. Duterte was referring to his predecessor, former President Benigno “Noynoy” Aquino III, and Noynoy’s mother, the late former President Corazon “Cory” Aquino. Cory was installed into power in 1986 following the EDSA People Power Revolution calling for Marcos’ ouster. Duterte said though he did not share the sentiment of the protesters, but would not try to stop them. “I may disagree, but I will defend their rights,” he said. Tens of thousands of suspected communist rebels and political foes were killed before Marcos’s 1986 ouster in a “people’s power” revolt. He died in exile in Hawaii three years later. In 1986, a commission was created to recover the Marcos family’s wealth, which was estimated at $10 billion worth of property, cash, stocks, jewellery and pieces of art. It has, so far, recovered about half. The body of Marcos was until last week kept in a mausoleum in his home province. Successive governments blocked the burial because they were either led by opponents of Marcos or had bowed to public pressure.